This product is used for charging mobile device and humidifying with fragrance. It adopts atomization technology with frequency 110KHZ to convert the water to droplet with diameter 6um and effectively rule out static electricity and dust, reduce the humidity in car, and moisturize the air. The uniform volatilization could bring comfortable feeling to skin. Powerful Air Purifier: Effectively eliminating secondhand smoke, in-car odor, car exhaust, food smell or other bad smell. Safe Function Design: The car humidifier is designed with a function that can turn to standby to protect from dry heating. Unique Technology: Adopting atomization technology with frequency 110KHZ to convert the water to droplet with diameter 6um. Dual Mode: The car humidifier support 2H intermittent spray and 1H constant humidification, which can be adjusted as you like. 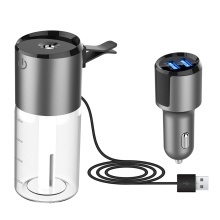 Dual USB Charger: Coming with a dual USB car charger. USB Output: 5V/1A 、QC3.0. Charging and humidifying at the same time. Widely Use: Essential oil diffuser is not only used in car, but also used in home, office. Very convenient for use in anywhere. Good For Health: Purifying the air inside the car, healthy humidification, bringing comfortable and relaxed mood when driving. Ultrasonic Humidifier: Working quietly without producing any bothering noises, which is very helpful for your sleep quality. 1.Do not switch to diffuser mode when the water tank is empty. 2.Please switch it off when pouring water to the bottle for long life. 3.Clean the water on the spray hole when it is blocked by plentiful water. 4.The content of the water tank is 100ml. Better to put water less than 80ml.